Middlesbrough railway station serves Middlesbrough and surrounding areas. The station is managed by TransPennine Express and has two platforms. 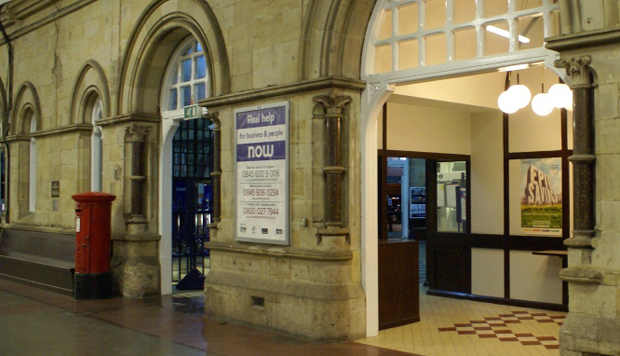 First Transpennine Services are available daily to York (for long distance connections by GNER and Virgin Cross Country), Leeds, Manchester, Mancester Airport and Liverpool. There are also two avoiding freight lines to the north of the station. Northern trains heading to Newcastle, Whitby and the MetroCentre start here, as well as the TransPennine Express service to Manchester Airport. It is also a calling point for Northern services running from Darlington to Saltburn, Bishop Auckland to Saltburn and Nunthorpe to Darlington. Secure waiting rooms with seating available by the Travel Centre and on Platform 1 and Platform 2. Open during booking office opening times. Outside of these times, waiting rooms can be opened on request. Accessible for wheelchairs.